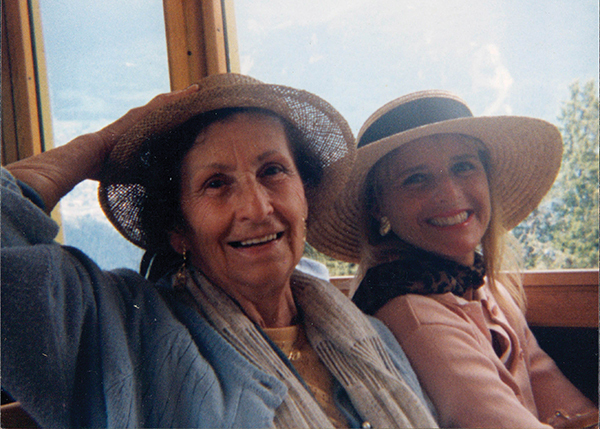 Anita Landsberger, at left, and Barbara Kenas in Switzerland. 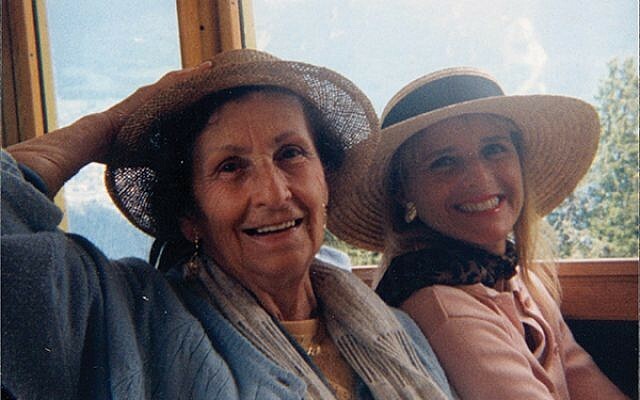 My Aunt Anita asked me to join her on a trip to Interlaken, Switzerland, back in 1995. I knew my aunt was in the war because her left arm was forever scarred with the number 73050. But it was in Switzerland — surrounded by the majestic Alps — that my aunt started telling me stories about her life and what happened to her during the war years. An incredible bonding took form between us and I felt a strong sense of destiny. I was 48 years old when my aunt chose to reveal her innermost thoughts and feelings to me. She was an artist, loved nature and travel; I had no idea that she was also courageous for enduring all the horror. Anita Landsberger was born in 1909 in Hamburg, Germany, and grew up in a very loving and affluent Jewish family. She was a kindergarten teacher until her school was closed due to anti-Jewish laws, and at 24 she left home for the first time and went to Prague to be a governess for a wealthy Jewish family. She always loved children. As the situation worsened for the Jews in Prague she went into hiding. Eventually she was found, and on Feb. 2, 1942, was packed into a cattle car headed to Terezin. My aunt spent 38 months in concentration camps — she was beaten, raped, and starved. The war’s end spared her from the gas chamber. Of all the stories she told me, the most heart-wrenching was that of another Anita Landsberger — yes, she and my aunt shared the same first and last names. Little Anita was a 7-year-old girl from Berlin, and my aunt was in her 30s when she met her in Auschwitz. But on March 7, 1944, little Anita was sent to the gas chamber. My aunt was a witness to this tragic event. It made such an impact on her that for 50 years after the war, my aunt wrote a poem in memory of little Anita every March 7 so she would not be forgotten. One of these poems is in the U.S. Holocaust Memorial Museum in Washington, D.C.
My aunt died in 2004, and since then remembering little Anita Landsberger has fallen on my shoulders. This March 7 will be the 75th anniversary of her death. There is no grave. There are no photos of her. But she will be remembered — in my heart, and in the words of my beloved Aunt Anita. Here is the day we must never forget! It seems the sun forever has set. and young Anita — you too were not spared. There were no angels who could have cared. There you stood — no smile, silent, sad and pale. So unfair — not even to own a small toy. Never to see a bird — to jump and climb a tree. In despair I still hear a bang at the door of the gate. Barbara Kenas of Marlboro is a real estate agent and proud wife, mom, and grandma. This column is dedicated to both Anita Landsbergers and to all the children who perished in the war — may they never be forgotten.